Babies R Us is having a great deal to promote the new Pampers Dry Max diapers. Today only you get a $20 gift card with the purchase of 2 value boxes of Pampers. This is in-store and online. We buy all our diapers at Babies R Us. Many times they offer a gift card deal with a purchase and I always have at least a dollar off coupon for each box. We buy two boxes at a time anyway, so this is a sweet deal for us. If you plan on taking advantage of this, go now. Right now. Because they don't do rain checks. We are already there. We were there when the doors opened, along with 50 bajillion other shoppers. Well, if I wasn't all ready to jump back into blogging when my laptop decided to take a break. Hmph! I have been putting up with a few PC jokes around here, but really I think it was just the closeness of a certain Mac that had it sputtering. All my recent pictures are on it. Since it is not the hard dive, but a power issue, I am not really worried. Except the fact that I have no new pictures to share. I can report that vocabulary has jumped once again overnight. ~Abby now calls Olivia "Shissy" even though we have never once called them this. We always call them by their names with an occasional "sister" thrown in. I am forever hearing "Where Shissy?" then Abby will get up and walk around calling, "Shissy?" Olivia said "Abby" for the first time tonight. ~They say "Go bye bye? in da ca? I shoes? I hat?" every day. Every.day. And really do not want to hear no as the answer. ~They call the swing and slide outside "the wee" because they say "wheee!" when going down it or when they are swinging. Olivia was actually saying it in her sleep the other night and pointing straight up at the ceiling. She loves to wee! And she must have her hat on to go outside. And she wants me to have one on as well. ~They get their purse on their arm, put a hat on their head and call "Buh-bye!" and head down the hall to go the store. ~Olivia wakes up and says, "I go night-night" then when she wants to head downstairs "I eat"
~When I give them any kind of snack, whether it should be in a bowl or not, Abby says "Bowl?" She even knows where to find one and gets it herself. ~When a cup or bowl is empty and need of a re-fill, Olivia says "Nee nee?" I have no idea where this came from. Maybe empty? But we say "all gone". Abby has just started saying it, too. Abby: I blah blibbity bloo bleh ha? Olivia: Nnnoo... Smecka wit blap blet? Abby: No... Mommy haty wase blahity? And it goes on and on like they are talking. I guess they are! They still babble along with their gibberish, but they are getting to where we can actually understand what they are saying. It's really exiting! I know this post was a bit all over the place. I was in a posting mood. I am sorry there are no new pictures. I will hopefully get the pictures off my computer soon. 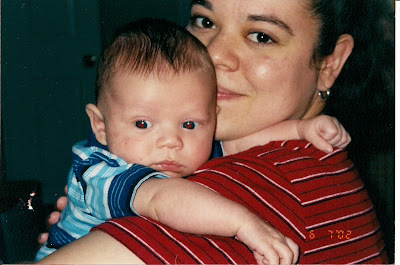 blogging funk=things getting crossed off "the list"
I am sharing my favorite picture of Zachary and I when he was a baby. when I held him in my arms. I loved being his mommy. And don't forget to click! ...it's happening all around me. ~The office is now a playroom! Pictures will follow soon. We chose beautiful colors for the walls and I found the perfect fabric! I can't wait to show it off for you. ~This means I have my loverly dining room back. Have I ever posted pictures of my loverly dining room?? It is gorg! One of my favorite things I have done to the house! ~The computers and bookcases filled with books have come to rest in our bedroom. It is by far the biggest room in the house. Everything fit without us moving one piece of furniture that was in there. Well, I am not counting the Ab machine that had turned into a clothesline, mmkay? That has found it's way into the garage. ~This also means all things office have found a home (or not) around the house. I am working hard to find a home for everything and it is HARD work, people! I am also learning that some things home is the trash **GASP** I know!! ~There a million and fifty-five little tiny things that need to be done. Both Gary and I have had our moments of looking around and wailing, "It will never get done, NEVER!" Ok, so I wailed. He did have his moment though. ~Simple Thursday will return - It keeps me on track. Especially with all this upheaval. Especially since I found stacks and stacks of things I love but do not use. Ugh! That will def be a post for another time. ~I am on my old computer without any new pictures so there is nothing new to show you. Sorry about that! ~ And last but not least...please click on the button below. The website has reset all their numbers so I want to get in there once again. As long as you land on the home page, your vote for me has been counted. You can click once a day. So please do so!